Dogs with cancer have special nutritional requirements and feeding your dog a cancer fighting diet can be an important component of treatment. Some of the most comprehensive work on this subject was done by Gregory Ogilvie, DVM at Colorado State University. Dr. Ogilvie had previously worked in the Boston area, and treated one of my dogs for lymphoma many years ago, so I was already familiar with his commitment, compassion, and vast knowledge about dogs with cancer. Also very interesting was the work done by Dr. Johanna Budwig, for which the famous Budwig protocol was named after. More information about Dr. Budwig's work featuring flaxseed oil and low-fat cottage cheese can be found at the bottom of this page. I incorporated the work of both these physicians into Beanny's anti-cancer diet. Dr. Ogilvie found that while cancer cells thrive on sugars, they starve the body of proteins and carbohydrates. Cancer cells can use sugars, but not specific types of fats as a primary source of energy. When the cancer cells use sugars for energy, they produce lactate, a waste product that poisons the host. Lactate depletes the dog's energy, allowing the cancer to weaken the body and the tumor to grow stronger. This condition is called cancer cachexia. Beanny's anti-cancer diet was developed from vast array of resources. I read several books about both human and canine nutrition in cancer patients, spoke with alternative and natural therapy advocates and patients, and worked with a holistic veterinarian to be sure the diet was nutritionally complete. There are many other recipes which may work just as effectively, including a raw-food diet which some people swear by. I have provided this recipe for our website readers because it worked for Beanny and I hope it will work for you too. The diet is modeled after the research done by Gregory Ogilvie, DVM at Colorado State University. He found that while cancer cells thrive on sugars, they starve the body of proteins and carbohydrates. Cancer cells can use sugars, but not specific types of fats as a primary source of energy. When the cancer cells use sugars for energy, they produce lactate, a waste product that poisons the host. Lactate depletes the dog's energy, allowing the cancer to weaken the body and the tumor to grow stronger. This condition is called cancer cachexia. The diet recommended by Dr. Ogilvie consists of small amounts of complex carbohydrates, minimal quantities of rapidly absorbed simple sugars, high quality but modest amounts of digestible proteins, and certain types of fats. Beanny's diet is based on Dr. Ogilvie's findings as well as Dr. Johanna Budwig's Protocol of flaxseed oil and low-fat cottage cheese, and then was enhanced to add plentiful amounts of anti-oxidents and other foods and supplements thought to be cancer fighting. Most holistic veterinarians will tell you to immediately stop feeding your dog commercial pet food as the ingredients are often not of high quality and the processing of the food significantly decreases the nutritional benefits. A diet made with whole, raw, and non-processed foods enables the dog to get the maximum nutritional benefits. It is imperative that you boost the dog's immune system so it can fight the cancer. Beanny started the diet as soon as he was diagnosed with cancer and continued with it all through his chemotherapy treatments and until the day he died. He tolerated the chemotherapy relatively well and he was extremely healthy until he slipped on the ice and died from surgical complications. I truly believe the diet and essiac tea were major contributors to his great health and aided in his ability to fight the cancer. This diet was developed for a 120 lb. dog. Portions will need to be altered according to your dog's weight. 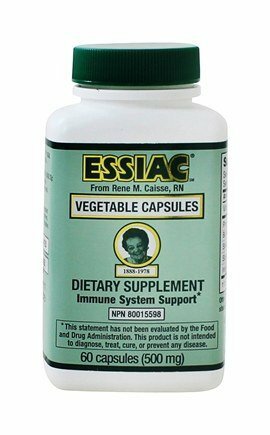 If your dog won't drink the Essiac tea straight, try pouring 2 oz. on a plate and soak it up with whole wheat bread. My dog loved it! We offer online shopping for some of the more specialized supplements on Beanny's diet through Amazon.com. My dog won't eat, What do I do? It's a fact that many illness impact a dog's metabolism. Changes occur in the way the body uses proteins, fats, and carbohydrates in a way to fight for survival. Some of these metabolic changes can become exaggerated or prolonged to the point that they are harmful rather than beneficial. Significant weight loss and muscle wasting can occur rapidly and can be difficult or even impossible to reverse. The typical problem with dogs with cancer is the refusal to eat their normal food or any food at all. You may be able to coax your dog to eat table foods, but these may lack the essential nutrients that your dogs requires at this time. A dog with cancer loses weight either because of decreased food intake and/or the metabolic effects of the disease. There is often more than one cause for decreased appetite. Some of the causes are related to the disease itself and some are side effects of cancer treatment. Human cancer patients can experience changes in their sense of smell and taste. Sometimes this is the result of the disease, sometimes secondary to a nutrient deficiency such as zinc, and sometimes due to side-effects of drugs or other forms of treatment. require anesthesia which involves periods of fasting before and after each episode. One serious and unpleasant consequence is that the dog may associate them with the act of eating or even the sight or smell of food with nausea or pain. This is called learned food aversion. Food aversion is a well-recognized phenomenon in human patients. Most everyone has experienced an occasion when they have become ill after eating a particular food. Whether or not that food was responsible for the illness, it becomes associated with it in our minds. Although difficult to prove, we believe that this occurs on dogs as well. One of the greatest challenges in feeding the pet with cancer is preventing the development of food aversions whenever possible, and dealing with this condition when it does occur. Because we have to guess what a dog is experiencing when he refuses food it can be hard to determine the best course of action. On the one hand we might work hard to coax a pet with palatable or novel food items in the hope of finding something that will be eaten voluntarily. On the other hand it might be best to back off for awhile and rely on an artificial form of nutrition (such as tube feeding) or even not feeding at all because of the risk of causing or exacerbating a learned food aversion. Listed below are some general guidelines on how to approach these patients. Remember that every patient is different, and requires individualized care and attention. No one thing will work in for every animal--be patient and sensitive to the pet's changing needs. Resist the temptation to coax a pet to eat when he or she is feeling or showing overt signs of nausea or discomfort. Pets that gulp or drool at the sight or smell of food, turn their heads away, spit out food when placed in the mouth, or bury the food under their bedding should be left alone. Pushing food on a patient who clearly does not want it is a good recipe for creating a learned food aversion. Discuss the possibility of anti-emetic drugs with your veterinarian if you think nausea and vomiting are a problem. Also discuss the use of tube feeding. Many factors must be considered when deciding whether a pet is a candidate for nutritional support. These techniques are not appropriate or feasible for every pet, but can be used successfully in many cases. A few drugs have been used to stimulate the appetite. In our opinion, these drugs are best used in helping patients get over learned food aversions AFTER they have begun to feel better. If your pet is showing some interest in food, there are many things you can try in order to increase interest in food. Try novel food items. If your pet has begun to associate a previously favorite food with unpleasant sensations, introducing a very different type of food may overcome the aversion to eating. This can backfire if the patient is still unwell, since the aversion may simply transfer to the new food. Any type of food can be used including dog foods (for dogs), cat foods (for dogs or cats), and palatable table foods. Remember that table foods will not provide all of the nutrients that a pet needs. If a pet eats an exclusively home-cooked diet for any period of time, you should get some advice on how to make that diet more complete and balanced. Try offering food in a novel setting or have someone different do the feeding. Sometimes an animal will associate its surroundings with past unpleasant experiences. For instance, a patient may no longer eat in the kitchen but will eat on an outside deck. Also, remember that dogs are social animals and may be more likely to eat with their pack--which includes you! Coaxing a dog to eat during family mealtimes or with other pets present might be successful. Make mealtimes as comfortable and unstressful as possible. Try not to schedule them at the same time that you do other treatments such as pilling. Avoid pushing food on your pet. Stroke and talk to your pet with food nearby and watch for any signs of interest. Divide the day's food into as many small meals as your schedule will permit. The food ingredients that increase palatability for most dogs and cats are moisture, fat, and protein. Adding water to a dry pet food or switching to canned food may improve food acceptance. A pet's tolerance of certain nutrients must be considered when trying new foods. Animals with kidney or liver dysfunction may not tolerate high protein intake. Animals with some types of gastrointestinal disease cannot tolerate large amounts of dietary fat. The standard advice for getting anorexic pets to eat has been to warm foods to just below body temperature. This is believed to increase the aroma of food, which in turn will enhance taste. Recently, there is some evidence that this might be counterproductive in animals that are exhibiting food aversion. This makes sense, since these patients may be hungry but have learned to associate certain smells or flavors with feeling badly. In these cases, offering food at room temperature or even chilled may meet with more success. Because the syndrome of cancer cachexia (profound weight loss) can involve more than decreased food intake, even the best efforts in encouraging a pet to eat may not prevent weight loss. This is because cancer can involve alterations in normal metabolism that are not overcome simply by providing calories and nutrients. Certain types of tumors can produce substances that affect energy and protein metabolism. The tumor itself competes for some of the nutrients that should be going to the patient. In addition, the patient's immune system produces a variety of substances in response to the tumor. For the most part these are beneficial, but they can cause alterations in metabolism that result in decreased appetite, weight loss, and loss of muscle mass. Meeting the basic nutritional needs of a cancer patient can be a significant challenge. In human cancer patients, it is established that malnutrition can increase the risk of complications and decrease survival rates. Patients with good nutritional status have an improved response to therapy and better quality of life. While the effects of malnutrition have not as yet been studied in veterinary patients, it seems likely that the results would be similar. My Dog won't eat what do I do? Tumors may physically interfere with eating and digesting food. For example, tumors of the oral cavity may cause difficulties with chewing and swallowing. Tumors of the stomach or intestines may obstruct the normal passage of food or the absorption of nutrients. Cancer therapies may also have a direct impact on the gastrointestinal tract. Some drugs cause nausea and vomiting. Others may actually injure the cells lining the intestines. Radiation is often used to treat tumors of the oral cavity which can cause inflammation and ulceration of surrounding mucous membranes. Surgical removal of tumors involving parts of the digestive tract can obviously affect a patient's ability to eat or digest food. For example, it might be necessary to remove part of a patient's jaw, tongue, or intestines. Surgery and radiation therapy require anesthesia which involves periods of fasting before and after each episode. Learn About the Dog Cancer Diet That Defied the Odds and Restored Henry Back to Health! Sadly, cancer in dogs is on the rise. I first became aware of the dog cancer epidemic when my dog Henry was diagnosed with a malignant form of Hemangiosarcoma (an aggressive form of dog cancer). In bad shape and given six to eight weeks to live max, things didn’t look too good for us. The conventional approach of multiple surgeries and weekly chemo treatments seemed to be futile and beyond my financial means. Instead I developed a holistic canine cancer diet that restored Henry back to health.